With a few hours to spare this afternoon I headed for Blackwall in London to pay a fleeting visit to London’s only (proper) lighthouse. 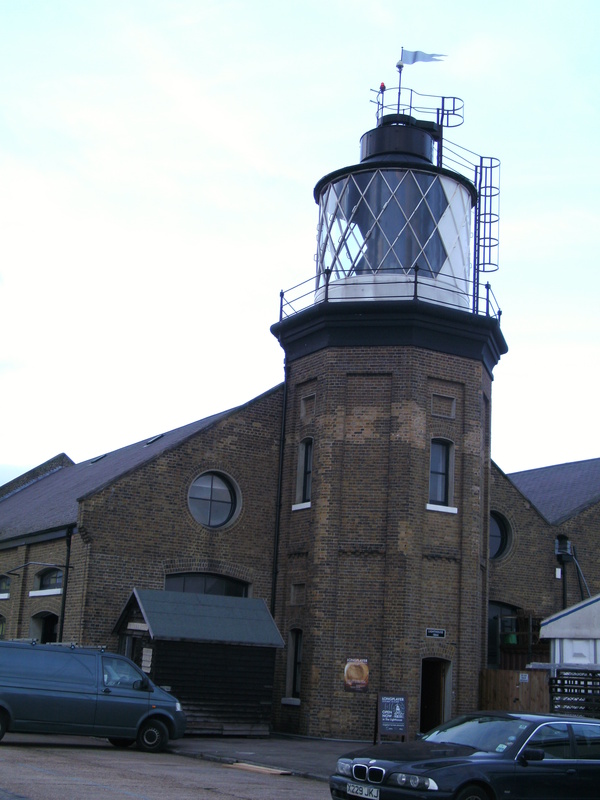 The Thames is littered with various light structures to enable good navigation along the winding river, but there is only one true brick lighthouse along its banks (unless you go as far as Gravesend). So, of course, I had to see it. And here it is! The area was originally used for training new lighthouse keepers and the current lighthouse/structure was built in 1863-4. The lighthouse has never been used for navigational purposes, but continued to be used for training purposes until 1988. Lightships were also repaired alongside the dock here until 1988. Although this has now been moved to Harwich, I was pleased to see two light vessels there today (you can see pictures of these in my photo section). The whole area is now mainly used for arts and cultural activities, which is lovely, but there is a strange sort of musical(?) exhibition taking place inside the lighthouse. I was able to climb the steps of the lighthouse to the lamp room, but was a bit put off by the weird and daunting sounds coming through speakers in the room!